Clacton Pavilion in poor repair. 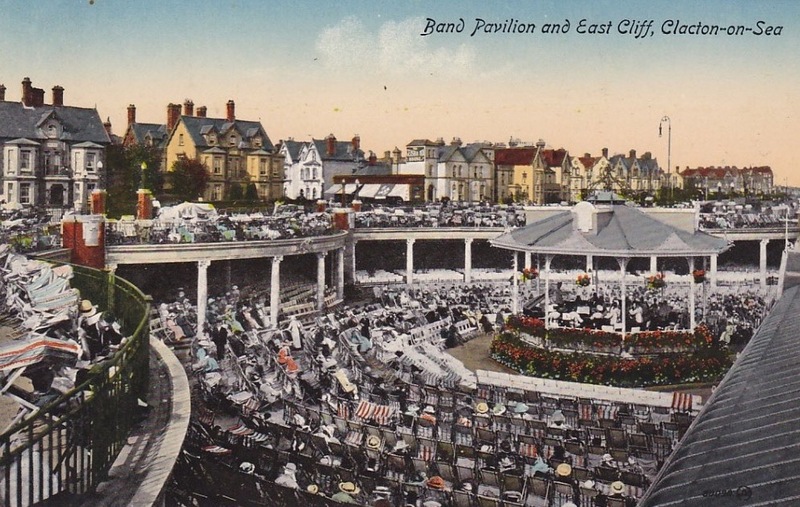 The beginnings of Clacton’s Band Pavilion can be traced back to 1886, when a local musician called George Badger was contracted by the Council to provide Clacton’s first Town Band of ten “thoroughly good and efficient musicians all dressed in uniform.” The band was to play for at least seven hours per day and the weekly wage of £10 to share between himself and the 10 musicians. At first the band played at various sites around the town but eventually it was felt desirable to build a proper bandstand for them, so they would have a permanent place to play. In 1899 therefore, a new bandstand was built for them, as well as for visiting bands, to play for the holidaymakers. It was erected on the greensward opposite the bottom of Colne Road. 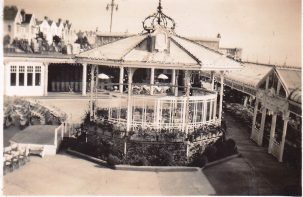 In 1912, Clacton Council made plans for what they called a “General Beautifying Programme” intended to landscape Pier Gap with flower beds and a new bridge and to build a new home for the Bandstand behind a new glass-fronted Pavilion to protect audiences from the rather stiff sea breezes that Clacton is sometimes known to suffer from. On Wednesday 27 May 1914 the grand official opening of the landscaped Pier Gap, the Venetian Bridge and the new Band Pavilion took place. It had been a great day for Clacton with the opening of this big scheme and was a sign of the growing confidence in the town and its ability to attract visitors from far and wide. 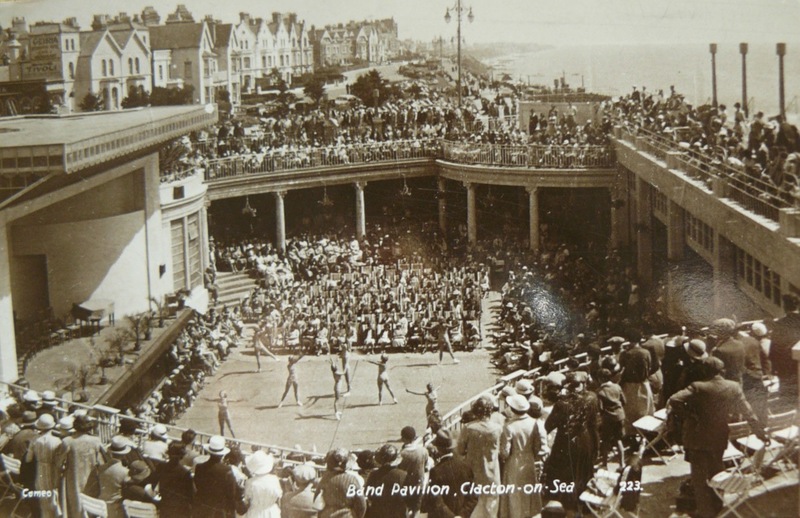 Sadly although this was supposed to herald a new dawn for Clacton and increase visitor numbers, World War One broke out not long afterwards and Clacton’s rise as a seaside resort was put on hold for the duration. 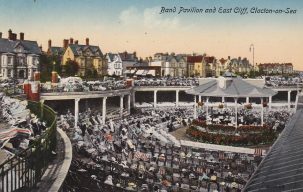 Once the War was over, the Bandstand returned to regular use. Military bands played three times daily from early June to late September while renowned vocalists sang at the afternoon and evening concerts. As well as band concerts, other shows were put on. Regular visitors were the Daily Mirror Eight, who performed dance shows with the emphasis on keep fit displays. But there were some more big changes on their way for the Pavilion. 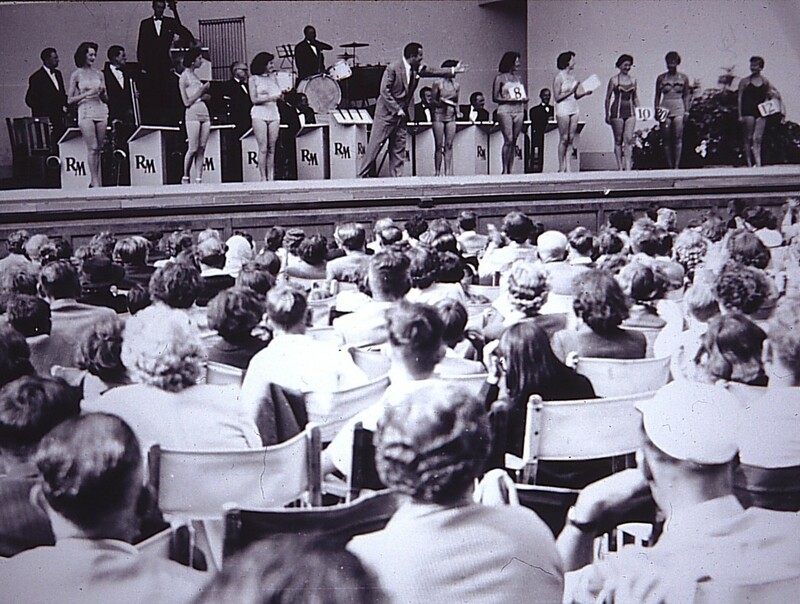 With the big increase of visitors to Clacton and the insatiable need to provide the growing numbers with more and more entertainment, it was decided to do away with the old bandstand altogether and build a stage with a more theatre like appearance as it was felt this would give more flexibility for the sort of shows and performances that could be held there. 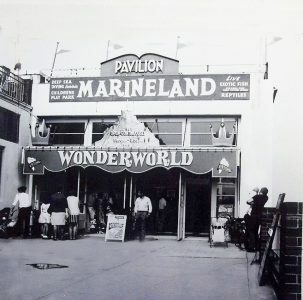 The new look Pavilion was opened to the public in 1936. There was now a stage instead of the old bandstand and the downstairs area could be used as a large flat floor area for performances and shows, or could be filled with seats if only the stage was needed. A number of different types of shows were put on including acrobatic acts as well as the famous Dagenham Girl Pipers and, of course, the Daily Mirror Eight. 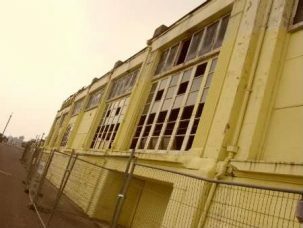 As part of this new complex, the Council also added a Winter Garden which looked out through the windows on to the sea with a new enclosed ballroom. In all, the open air theatre could seat over 2000 people, while the indoor Winter Garden could also be converted to a smaller theatre seating 800. The two could also be combined making a total capacity of 3000. Out of season, the Winter Garden was laid out for indoor bowls and Clacton Indoor Bowls Club started here in December 1936. It was also used for other major events. For example, one of the World’s greatest ever boxers, Henry Armstrong, the first to hold three world titles at different weights simultaneously, trained there in advance of his fight against Ernie Roderick, at Harringay in London on 25 May 1939. Another feature of the new building was the sun deck built over the Pavilion, where you could go and lay out at any time to get your sun tan. Once again though, a world war intervened and most entertainments, including those at the Pavilion, were stopped for the duration. As soon as the War was over, Clacton got back into the swing of things and the late 1940s and 1950s saw the town continue much as before the War. At the Pavilion itself, Dance Bands took over from the Military Bands and 1947 saw Younkman and his Czardas Band in residence for the season. They were followed by Bobby Howes, who performed with the Kelvedon Dancers led by Ivy Baker, a well-known Clacton name. And then in 1952 by Owen Walters and his Orchestra. It was also in 1952, that a young man called Harry Thompson was taken on by Clacton Council as their Entertainment and Publicity Manager. 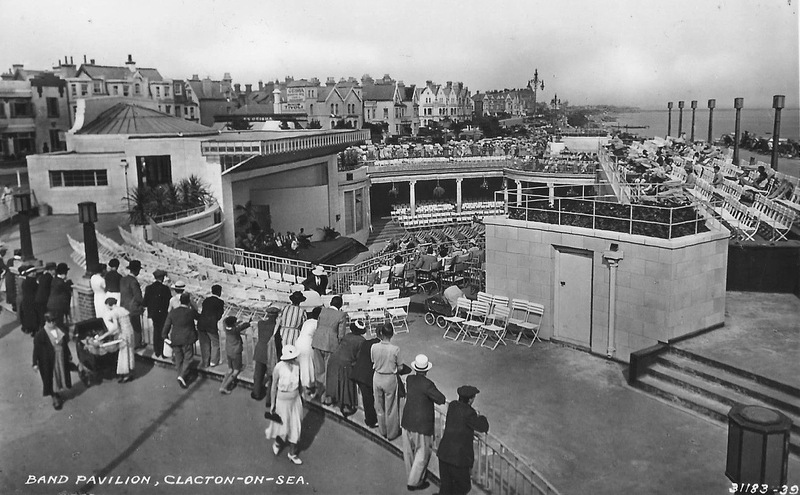 Harry was bubbling over with plans to promote Clacton and because the Pavilion belonged to the Council, he was able to take it over and stamp his ideas on it. One of the first things he did was to put the Pavilion into use all day and every day with many varied types of event including Quiz Nights, Bonny Baby competitions, Talent Shows (Search for the Stars) amongst many others. 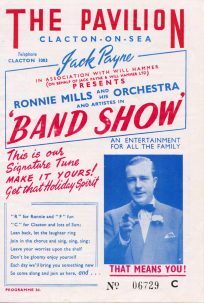 But his real masterstroke as far as the Band Pavilion was concerned was to bring Ronnie Mills in as the resident band leader in 1953. Ronnie became a Clacton institution and one of the most popular entertainers ever to appear in Clacton. Mills’s shows brought large crowds to the Pavilion which also played host to some of the world’s biggest bands such as Mantovani, Ted Heath and Ray Connif. Names like that assured capacity audiences of 3000. Other major events included the Evening Standard Fashion Show, which ensured lots of publicity in London. 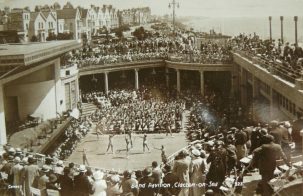 But the biggest event that Harry dreamt up for the Pavilion and Clacton was the Ideal Holiday Girl Competition which gained acres of space in the national newspapers and brought the crowds flocking to Clacton. Meanwhile the Winter Garden continued to be used for smaller events such as Ballroom Dancing, Old Time Music Hall and Rock ‘n’ Roll for the youngsters. 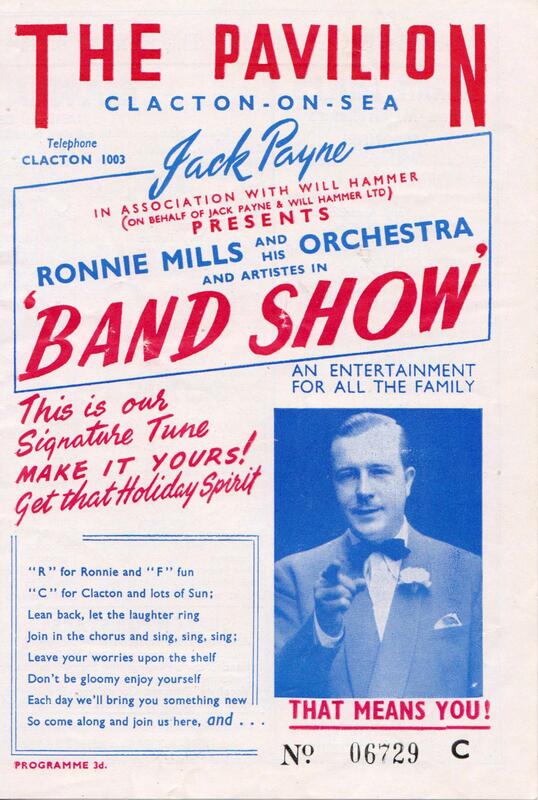 When Ronnie Mills’ reign came to an end in the early 1960s, Harry decided to put on a Summer variety season at the Pavilion, produced by Raymond Kerry and called the Rayker Revue, but it wasn’t a great success as there were other theatres in Clacton putting on similar shows and people felt the Band Pavilion should be used for its own unique shows that couldn’t be staged elsewhere. In the mid-60s a new name came to the Pavilion, Harold Taylor, and the shows reverted back to the audience participation type shows, as this is what the Pavilion was able to do best, using both the main arena and the Winter Garden. And then sometime in the 1970s, the Laughing Clown appeared at the entrance. The closure of Butlins in 1983 seemed to be the final nail in Clacton’s coffin and by the late 1980s and early 90s, Clacton seemed to be going into terminal decline with the Pavilion as well beginning to suffer from neglect and seemingly headed the same way. From the outside area it become a real eyesore and in its own way was a symbol of Clacton’s decline as a major seaside resort. Things were looking bleak not just for the Pavilion but for Clacton itself. 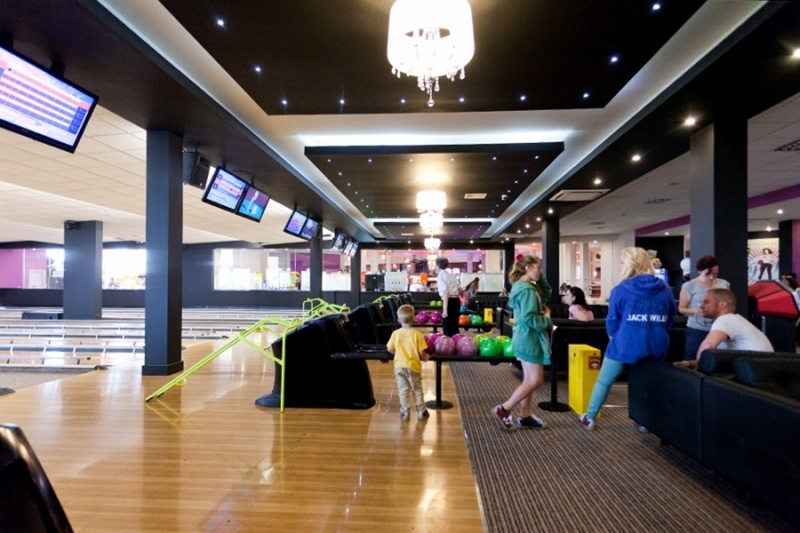 But in the late 1990s, there was a bit of a revival in Clacton’s fortunes as people began to discover it all over again as a place to visit, maybe not for a week’s holiday but definitely for a day trip or a weekend. And it was at this point that Billy Peak stepped into the picture and, after much negotiation with the Council, who still owned the Pavilion as it had done ever since it was built, he took out a long lease on it so that he was able to plan for the future and to revive the fortunes of the Pavilion both inside and out and bit by bit Billy transformed the old Pavilion site. The top outside pavement level was converted into a new much expanded Fun Park, which is still expanding along Marine Parade extending the Pavilion well past its original footfall and now extending past Orwell Road. And finally, the old Winter Gardens area was transformed into arguably the best restaurant in Clacton, Armstrong’s, named after Henry Armstrong, the boxer mentioned earlier who trained here, a nod to the Pavilion’s tradition. And this tradition has been key to Billy’s plans for his transformation of the Pavilion, because although there was much new building work to be done, Billy was keen to save as much as possible of both the look and the actual fabric of the original building, something he has managed to do magnificently, so that, although we now have the brand new Pavilion, it is still deeply rooted in its tradition with many of the original features still visible, the glass front, the art deco curves and columns for example. 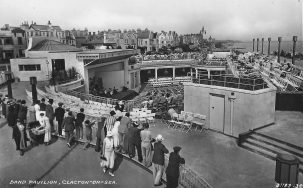 The Pavilion has been through a number of ups and downs in its time which have to a large extent mirrored the fortunes of Clacton. Different people of different ages will each have their own different memories of the place, depending how old they are. From the Military Bands to the Dance Bands, Ronnie Mills, Variety shows, the spectacular set pieces, the eyesore it undoubtedly was for a while and now its renaissance as an attractive entertainment and amusement centre right at the heart of Clacton’s main tourist area, along with the Pier, which has also been brought back to life in the last few years by Bobby Ball, and the newly re-opened Royal Hotel, once again helping to draw the crowds back to Clacton and re-establishing it in its rightful place on the map as one of Britain’s leading seaside resorts. *Norman Jacobs became well-known as a writer on local, family and sports history from the 1970s onwards. His first book on local history, Clacton in Camera, was published in 1984. He has now had a total of 25 books published.